The ferry between PEI and Nova Scotia. It will take cars as well as bikes and pedestrians. There are many ways to reach Nova Scotia. There is another airport in Sydney, the biggest city on Cape Breton Island, but you’re unlikely to use it, unless you’re flying in from one of the nearby regional centres in New Brunswick, Newfoundland or on Prince Edward Island. 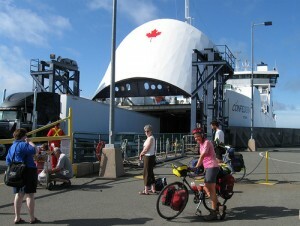 All of these ferries will take cars, RVs and motorbikes as well as bicycles and foot passengers. However you arrive, remember to book your plane tickets, ferry tickets and car rental well ahead of time during the peak summer season. Don’t worry about booking ahead so much in the winter (unless you’re visiting around a public holiday like Thanksgiving or Christmas) but you will need to allow for weather-related travel delays anytime between November and April.